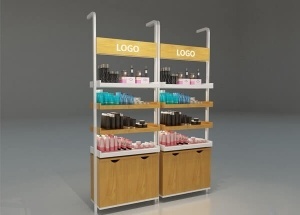 wholesale retail shop display racks, or do shop interior design, call at 0086 13825185029. 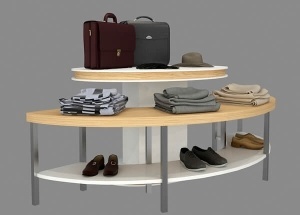 This half round store display tables is a front furniture or gondola display table for shops. It can be used in clothes shop, baby shops, shoe shop, bags shop. 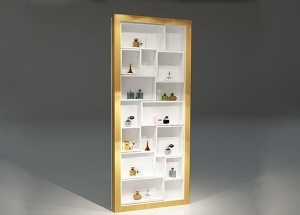 It is made by wooden (MDF), with baking finish. 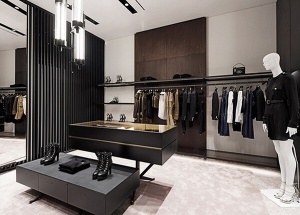 This clothing boutique design was for Dsquared2 brand shop for man and lady clothes, bags,shoes. offer clothing boutique ideas. 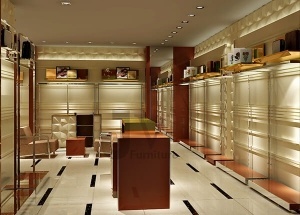 The store racks and shelves was design for WOMES clothes shop project in China. 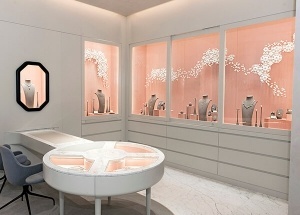 This jewellery showroom design in india was for Indian nirav modi jewellery shop project. It's maily using milky white and black color baking paint wooden and glass indian jewellery counter and wall jewellery showacase. 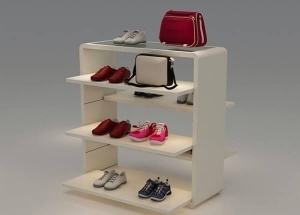 This wall shoe display cabinet is used to display shoes and bags for men shoes&bags store.It is made by wooden(MDF),metal,LED lights,etc.